Why not brighten up your kitchen with these fantastic fridge sticker designs? Perfect for adding some floral flair, canine cuteness or a funky fruit theme to any fridge or kitchen surface, these waterproof, self-adhesive vinyl stickers are ideal for use on fridges or coolers as they can be hygienically wiped down time and time again. Our Fridge Stickers come in eight different designs. Choose from Fruit Stickers, Dog Stickers, Cat Stickers, Daffodil Stickers, Butterfly Stickers, Tulip Stickers, Wine Stickers and Lily Stickers. 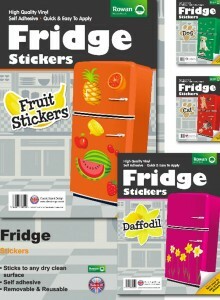 Thanks to their durable, waterproof finish Fridge Stickers can be used on many other household and everyday items too. Why not add some colour to your garage door, wheelie bin, caravan, car, boat, mobile phone, dog or cat bowl, or use them as a frieze to decorate your child’s bedroom? Fridge stickers are perfect for use on many outdoor items – what better way to individualise a bicycle, scooter or even your wheelie bin to make sure they never go walkabout again. 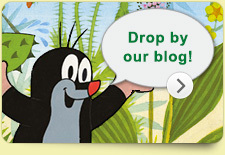 Each Fridge Sticker set comes with a minimum of ten stickers in a range of formats and designs. Mix and match several sticker packs or stick with a single theme – whichever you choose, they are guaranteed to bring your kitchen or household items to life.